I am starting the New Year by addressing the often heard myth that within the Rules of Golf there is no occasion where a ball may be dropped on a putting green. In fact, there are six different Rules that permit a ball to be dropped directly onto a putting green. However, most players are unlikely to encounter any of these situations, so this blog will definitely be of more interest to Rules enthusiasts than to the average weekend golfer. This is my overview of the six occasions when a ball may be dropped on a putting green. You may find it useful to have a Rule book handy to reference the Rule numbers. If a player has deemed their ball unplayable and there is an area on a putting green that meets the requirements of either option b or option c of Rule 28, they may drop their ball there. Note that I have said a putting green, which means that it is not necessarily the putting green of the hole being played. If a ball is dropped and comes to rest on a different putting green the player would then have to follow the procedure in Rule 25-3, Wrong Putting Green, as a ball may not be played from this place. In fact, Decision 28/11, describes a situation that allows a player to drop a ball on a putting green, the only time that this action is referred to in the Decisions on the Rules of Golf 2016-2017. Q. A player's ball is eight feet off the ground, lodged in a tree. The player deems the ball unplayable. May the player proceed under option c of Rule 28 which permits him to drop a ball within two club-lengths of where his ball lay unplayable? A. Yes. The player would be entitled to drop a ball within two club-lengths of the point on the ground immediately below the place where the ball lay in the tree. In some instances this may allow the player to drop a ball on a putting green. There are many courses where the margin of a lateral water hazard runs close to a putting green. This could mean that the permitted area of drop is on the putting green of either the hole being played, or another putting green. In these cases the player may drop the ball on the putting green, in fact they may not place a ball on the putting green, as the Rules do not permit. As above, a ball dropped on a wrong putting green that comes to rest on it must then be lifted and dropped according to Rule 25-3. These are undoubtedly the strangest situations in which a player may drop a ball on a putting green. 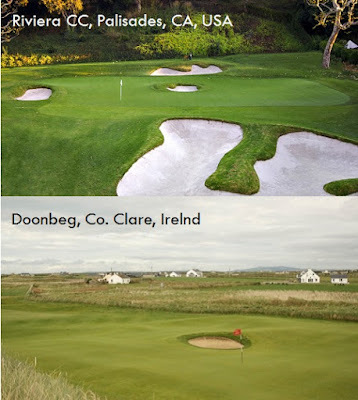 They relate to the extremely unusual circumstance where there is a bunker located within a putting green and there is either interference from an abnormal ground condition, typically casual water, or the ball is lost in an abnormal ground condition. If these circumstances prevail, and the player chooses to drop outside the bunker under penalty of one stroke keeping the point where the ball lay directly between the hole and the spot on which the ball is dropped, with no limit to how far behind the bunker the ball may be dropped, it could mean dropping on the putting green. Note that a player may not drop on a putting green under R27-1a, Ball Lost, or R26-1a, Water Hazards, as they both refer back to Rule 20-5, Making Next Stroke from Where Previous Stroke Was Made, part (d) of which states that the ball must be placed if it was last played from anywhere on a putting green. Thanks for reading this far. I promise that my next blog will be on a Rule that is encountered more often. Incidentally, my blogs will now be two-weekly rather than weekly, unless something really interesting happens at a Tour event that I cannot let pass. Maybe one more possibility. Interference with stance or area of intended swing by an ESA. When the ball is in the hazard and decides to take a penalty to drop the ball behind the hazard. Yes, providing a Local Rule defines the ESA as ground under repair. If an ESA interferes with the area of your intended stance or swing, you must take relief, regardless of how the ESA is defined. page 141 of the Rule Book. I believe that you have missed the point of my previous reply. A Local Rule for an ESA may also define the area as a water hazard or out of bounds, see Appendix l, 2c, Environmentally-Sensitive Areas, 1, Definition. Are you saying that interference to the area of intended swing by and ESA is only applicable if the ESA is defined as GUR? Perhaps I am now understand your point. If a player's ball lies in a bunker on the course, but there is something that is rooted in an ESA that overhangs the bunker and interferes with their stance or area of intended swing, then the player must drop the ball away from the interference and if they choose not to drop the ball in the bunker without penalty, but instead drop outside of the bunker for a penalty of one stroke, then yes there is a very remote possibilty that they might drop onto a putting green. Duh! Decision 20-3d/2 could result in dropping the ball on green. Yes, this is another possibility. Relief from TIO when ball is in a hazard and decides to take relief outside the hazard. Would 24-1b (ii)b also apply. There is no Rule 24-1b(ii)b! If you meant Rule 24-2b(ii)b, that is a possibility as per the edited note at the foot of the blog. You are on a very pitched, very large, very fast green with a tough pin, at the top. You have a one foot putt. You miss. The put rolls off the 50 foot green, and another yards down the approach. You are now 70-100 yds below the hole. Under the rules of golf, you can declare the ball unplayable. And as an unplayable, you can place at at the original point, which is ... One foot from the pin, an almost certain two putt from 100yds. Question: Do you hold at arm's length and drop at the one foot point? Or just place it as the drop is on the green? On this green any drop would roll more than two club lengths. The ball must be placed on the putting green at the estimated spot where it was last played from, Rules 27-1 and 20-5(d). If close to a green you want to invoke either 26-1c or 28C the permitted drop area of two club lengths might stretch over part of the green and part off. If under those circumstances the player drops off the green and the ball comes to rest on the green (within the two club lengths area and not nearer the hole) would the player be requested to re drop in accordance with Rule 20-2c(iii)?. No, this circumstance would not require that the ball be re-dropped; Rule 20-2c(iii) clearly states, "... rolls onto and comes to rest on a putting green". Similarly, if the ball was dropped onto the putting green within the permitted drop area, but rolled off within two club-lengths of where it first hit the course and not nearer the hole, it would also be in play. My apologies, I meant to say above that the ball dropped off the putting green that rolled onto the putting green must be re-dropped, because of the quoted reference in R20-2c(iii). However, the second circumstance that I described was correct, the ball is in play. If a ball lies in GUR and the nearest point of relief is on the green, do I drop on the green? The nearest point of relief must not be in a hazard or on a putting green.